The Belize National Football Team, the Jaguars is leaving the country today to play a game against Guyana on Saturday, 23rd March. The team flies out today and they will stay overnight in Panama on their way fulfill their Gold Cup dreams. On Wednesday they start their training at the sporting facility through Friday in preparation for the Saturday night game. A small ceremony in honor of the team was held at the Marion Jones Sporting Complex this morning and we spoke to the coach and players about their expectations in Guyana. Tonight, the Belize National Football Team, the Jaguars, is on its way to Guyana. Team Belize is preparing to play its final match of this round of the Concacaf Nation's League Tournament. Belize has a very good chance of making it into the top 10, and if they do so, the country will make history and qualify for the Gold Cup for a second time. If you've been following the team's performance you'll know that the Jaguars have played 3 international matches in this tournament so far, and they've won 2 out of 3. They defeated the Bahamas with a score of 4-nil, and Puerto Rico with a score of 1-nil. When they travelled to Montserrat for an away game, however, they lost with a final score of 0 to 1. Right now on CONCACAF's website, Belize is ranked 13th place, 3 away from qualifying to the Gold Cup, and so, this upcoming match against Guyana needs to be a win if the team wants to move up in time to qualify. 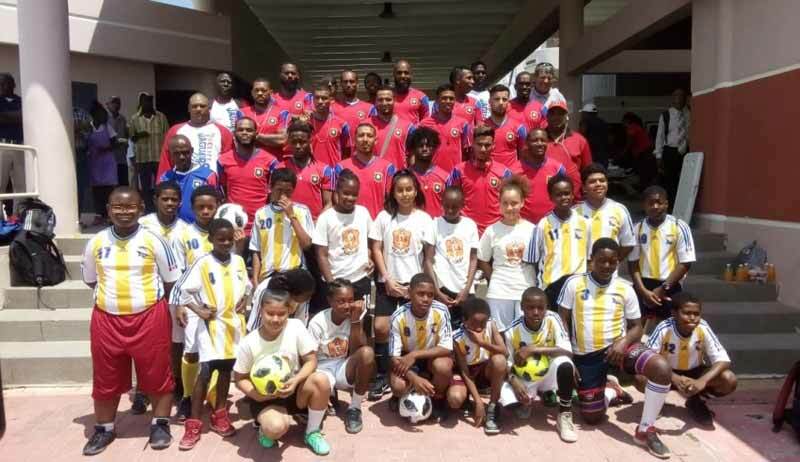 They are depending on the support of the Belizean football fans to keep morale high, as they try to defeat the Guyanese National team on their home turf. So, before the team left today, the Football Federation of Belize hosted a meet and greet event at the Marion Jones Sporting Complex Today. The team was greeted by a large group of primary school fans. The players interacted with the youths for a few hours before the left to catch their flight. Here's what the coach staff and several members of the team had to say about their prospects of winning this upcoming match. "We have studied Guyana. We have seen how they have played in their games, and we have studied them on tapes. They are physical. They are fast. Within the Caribbean countries, we know that these countries are physical. They are just like us, but I believe the technical part of the game, we are more technical than them. And that's what we've been working on in holding position of the ball. In holding position of the ball, that will give us opportunity and more looks at golds. And with more looks at goals, 1 will count. "For us in Belize, it's just a point. It's just the win. We don't need to really focus on goal. We need the 3 points which will give us 9, which will put us in the bracket of the top 10, in making it to the Gold Cup. 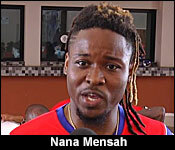 We are not pressured, depending on another country to beat another team by any score." "We need to go into Guyana; 1-nil will give us the 3 points that we need to make it, and repeat history once again. Everybody is physically prepared. Everybody is healthy, and we believe that we are carrying the best that we believe we have in Belize and internationally to repeat history. Our players are mentally focused." "We go out, and we train day in, day out. We train separately with your clubs, and then come to the National team on Monday.The coaches take us, the defenders one side, and they show us how they want us to move, and prepare us for whatever attack that Guyana might bring." "What level of game you think Guyana will bring on Saturday?" "Well, they're at home, so it's obvious that they're gonna come out attacking. 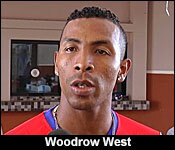 So, we have got to be prepared mentally for the first - at 20 minutes of the game because it's gonna start out intense." "I see our streets as - in the midfield, we're very strong. We have quality strikers, and our defensive line is very experienced. So, we I think that with experience, we have what it takes." "This is a nice opportunity for all of us because now, we are mature enough to know that football is about team. We are well prepared because the coaches took time out, and prepared us well for out there. So, whatever they come with, we are ready." 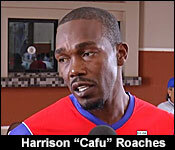 "Cafu you're one of the more experienced players on this particular. 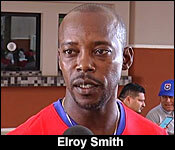 What part of our experience have you shared with the young players, going into the match with Guyana?" "Well, I tell them to be confident in themselves, and let us play as a team. Defend together, attack together, play together as a whole. Just play as a team." "The game in general is gonna be hard because we're gonna be on their turf. So, we have to be patient for the first 20 to 25 minutes of the game, hold out, and see what they're all about, and then stick to that plan and then execute after that, due to what the coach has been training this week with us." Team Belize takes on the Guyana National team on Saturday, March 23rd, at 2:30 in he afternoon, Belize time. As we showed you, the Assistant Coach asserted that the Jaguars only have to win this match and Belize qualifies to the Gold Cup. Well, experienced football enthusiasts tell us that it's not that simple. They say that goal differential could play a factor in the final 10 countries which qualify, and so, if Team Belize wants to assure that it has a spot in the Gold Cup, it needs to win by a comfortable margin. Currently, Guyana is sitting in the 8th place, which means that if they win the match, they may end up qualifying and ending Belize's chance to do so. Guyana Golden Jaguars Head-Coach Michael Johnson is adamant that his charges are well equipped and adequately prepared to create history against Belize on Saturday in the CONCACAF Nations League. Guyana will faceoff with the Central American side at the National Track and Field Centre, Leonora in a must-win encounter. Victory for the locals will seal their maiden berth in the Gold Cup. On the other hand, a win for the visitors would seal their second appearance in the event following their 2013 participation. According to Johnson, “We left no stones unturned this time and I’m happy with the way we went about preparing the team, especially with the extensive work we did for the locally based players,” The former Jamaica International, who participated in the event during his playing career, stated that the team possesses the quality to secure the victory, adding that the collection of players could possibly be the best group assembled in the recent memory. He said that there is little room for error and as such, the players selected for this pivotal contest are seasoned campaigners and understand the magnitude of the task ahead. Johnson further stated that the focus will be improving the chemistry of the team before the upcoming clash. The Golden Jaguars management team named a 23 member squad for the fixture, which features a whopping 16 foreign born and/or based players. Among the plethora of overseas players selected for the match at the National Track and Field Centre, Leonora, are possible debutants in defender Reiss Greenidge, Midfielder Anthony Jeffrey and Forward Keanu Marsh-Brown. On the other hand, the locally based players short-listed are Goalkeepers Alex Murray, Sese Norville, Defender Kevin Layne Midfielders Trayon Bobb, Clive Nobrega and Forwards Pernell Schultz and Gregory Richardson. The loss may have been narrow, but it stings nonetheless. That the national side, the Jaguars, had their opportunities in Saturday’s game with Guyana is not in doubt. That for the most part, they took them, is also not in doubt. .
On last week Tuesday's news, we told you about the final game that Belize's National Football Team, the Jaguars, was supposed to play against the Guyana National Team. They faced off at around 4:30 p.m., and when the final whistle was blown, Belize had lost the game with a final score of 2 to one. A press release from the FFB says, quote, "Unfortunately, we did not qualify to the 2019 Gold Cup so the next few weeks are crucial as the FFB will analyze and formulate a new strategy for the future A Team in preparation of the next CONCACAF Nation's League tournament. The new series of competitions are scheduled to begin in September 2019 and the Qatar 2022 World Cup qualifying matches. Although we did not take home the win on Saturday, Belize qualified for Group B in the next edition of the Nations League." End quote. The FFB also notes that goalkeeper Woodrow West put on a "spectacular" performance in this game, which allowed Belize's to keep the score as close as possible, all the way to the end of the match. Sporting similar 2 wins and 1 loss records, both the Guyana Golden Jaguars and our Belize Jaguars entered the Leonora Track & Field Stadium in Leonora, Guyana on Saturday at 4:30 p.m. with one objective – a victory, that would likely send the winner to the Gold Cup later this year in the USA. The two squads had very much in common, besides their name and appearance. Both Belize and Guyana are English speaking, former British colonies that are situated on the Atlantic coast; Belize is in Central America while Guyana is on the edge of South America, but both are culturally and historically very much a part of the Caribbean. Both are bordered by Spanish speaking neighbors, and each of us endures a current territorial claim by a bigger neighbor, Belize with Guatemala, and Guyana with Venezuela. But all that didn’t matter in Saturday’s football contest. Fielding a team with a strong veteran base, along with some splendid young talents, the Belize team started the game fast, matching the speed of the more muscular Guyana players, many of whom were recruited from their international contracts in the U.K. and elsewhere. First half was very competitive and exciting, but the speed game eventually favored Guyana, especially when their fast wingers began to have the better of our aging defence line, all of whom are over 35. Belize attempted to adjust our game to a slower pace in second half, but the damage had already been done in first half, where Guyana earned two penalties, one stopped by Woodrow West in goal for Belize, and another goal scored from a shot at the edge of the eighteen. Despite no recent international tune-up, our Belize Jaguars were very competitive, though our attacks lacked clear purpose and direction, resorting frequently to long high balls that were easily rejected by a stern Guyana defence. After Guyana took a 1-nil lead through a penalty at the 16th minute, Belize got a free kick from about 25 yards out at the 25th minute; and Elroy “Bibbs” Kuylen’s left footed drive over the wall and into the right “pigeon hole” to tie the game at 1-1 was world class, and will not be soon forgotten. Ten minutes later, Guyana got a second penalty, but West guessed correctly on Neil Danns’ effort this time around, and snatched the grounder from near the right goal post. Nevertheless, Guyana got what proved the game winner from a shot through a crowd by Emery Welshman at the 43rd minute. Second half was scoreless, and the Golden Jaguars of Guyana erupted in jubilation at the long whistle, their first trip to the Gold Cup secured. Our Belize Jaguars return home tomorrow, not to a hero’s welcome, but with much appreciation still for giving their best effort. For some of the veterans, this could well be their last outing with the National Team. Thank you, guys! Belize Jaguars line-up: #1 Woodrow West (goalkeeper); #7 Ian Gaynair (#18 Evral Trapp at 45’); #8 Elroy Smith; #13 Dalton Eiley; #5 Elroy Kuylen; #10 Michael Salazar (#11 Harrison Roches at 69’); #14 Andres Makin, Jr.; #17 Nahjib Guerra; #21 Nana Mensah (#3 Trevor Lennon at 63’); #16 Krisean Lopez; #9 Deon McCaulay. Coach – Palmiro Salas. PLB hostilities resume on the home front (Week 11) this weekend, with San Pedro Pirates hosting Assassins Altitude, and Bandits Sport hosting Freedom Fighters on Saturday night; and on Sunday afternoon, Verdes hosts BDF, and Wagiya hosts Police United.